*Stock is arriving in Australia later this year. When the opening riff of “Good Times Bad Times” came through the radio in 1969, everything changed. In that moment Jimmy Page cemented his legacy and altered the course of popular music with a single guitar: his Fender® Telecaster. 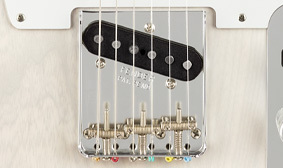 The Fender Jimmy Page Mirror Telecaster is an homage to that guitar, which began life in its factory White Blonde lacquer finish, then became the “mirror guitar” before transforming into a one-of-a-kind hand-painted instrument. At each stage in its evolution, this legendary guitar produced some of the most iconic riffs of the 20th Century. The Jimmy Page Mirror Telecaster features a two-piece ash body, lacquer finish and a pair of Jimmy Page Custom ’59 Tele® single-coil pickups that deliver the incendiary, full-bodied tone that inspired all the unforgettable licks on Led Zeppelin’s first album. The custom “Oval C”-shaped maple neck has a 7.25″-radius slab rosewood fingerboard with 21 vintage-style frets, giving it a smooth playing feel. 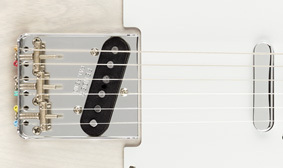 The “top-loader” bridge allows for through-body or top-load stringing, which produces a rounder, warmer tone and less tension so you can bend the strings with ease. 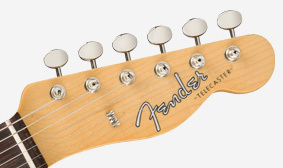 Other features include a bone nut vintage-style round string tree and Pure Vintage Single Line “Fender Deluxe” tuning machines for authentic style and performance. 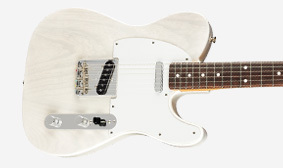 Just like Page’s original ’59 Telecaster, the two-piece body is crafted from ash. 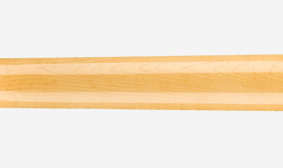 Extremely resonant, with well-defined mids, it also features an attractive grain. Not only is a lacquer finish an original-era design element, it lets the wood “breathe” with natural resonance while wearing in a distinctly personal way. 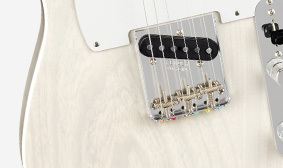 We duplicated the exact neck profile from Page’s Telecaster-the one that’s been worn by decades of playing, and capped it with a period-correct slab fingerboard. Designed for authentic Fender tone, the custom pickups are constructed with materials as close to the originals as we can get. Whichever way you prefer to string your guitar, string-through-body or top load, this reproduction of a rare 1959 bridge has you covered. These vintage-style tuning machines offer vintage cool aesthetics, combined with rock-solid stability.